In honor of the Year of Consecrated Life, The Athanaeum of Ohio invited Cardinal Oscar Rodriguez to speak to the religious sisters, brothers, and priests of the Archdiocese of Cincinnati.Cardinal Rodriguez is the Archbishop of Tegucigalpa, Honduras and is a member of the Salesians, a religious order founded by Saint John Bosco dedicated to working with the youth and poor. He also serves on a number of Vatican Congregations including the Congregation for Consecrated Life, and was appointed by Pope Francis to chair the newly established commission of cardinals as special advisors to the Holy Father. 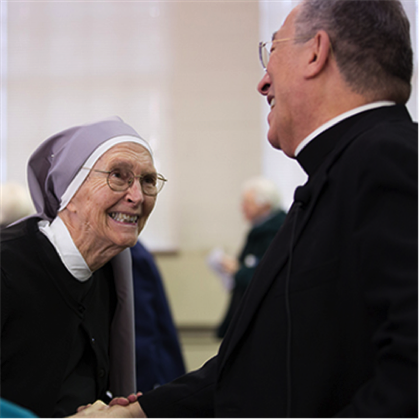 In his talk “The Joy of Consecrated Life: New Wine in New Wineskins” the Cardinal spoke of religious women and men as being witnesses and prophets of joy, and credited the Holy Spirit as maintaining this miracle of joy in consecrated life, a joy which is constantly born anew. He urged those present to be happy people and in turn, to make others happy. 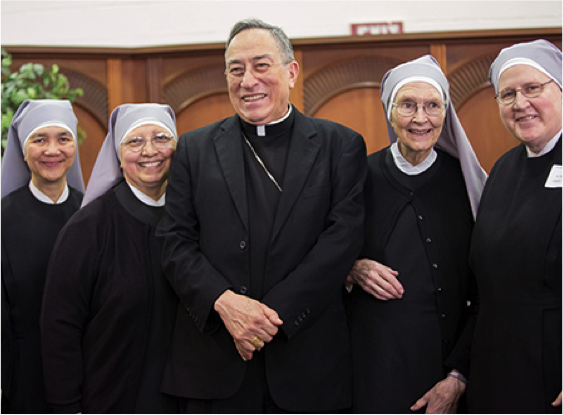 Click here to view Cardinal Rodriguez’s talk as a video archive. To view more photos from the Cardinal’s talk, click here.